Someone named "crotchhairs" sent this in. Thanks, crotchhairs. I am offering a prestiged children’s “life” booster chair. This is a bargain for any caring parent. 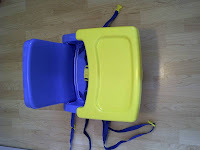 The chair features some left over power augmentating, biological manipulation power, which will significantly increase the nutrition levels of any food fed to your child. Benefit from trouble-free feeding as the chair will bestow ecological empathy to your child, the ability to sense the overall well-being and conditions of one's immediate environment and natural setting stemming from a psychic sensitivity to nature. Activate the chairs size shifting abilities by folding it up for convenient storage. Assure safety with the gravity manipulating buckle straps for easy attachment on most chair types. Its brilliant blue and yellow color design will yield increased stamina and energy. Having already consumed portions of the benefits from this life boosting chair, my daughter no longer requires its powers. She is now a successful direct debit membership professional development stock and credit administrator engineer. I am asking $25, please contact by email.